A novelty at Munich 2013. Groups of very well developed pyramidal Wurtzite crystals, of good size for the species. 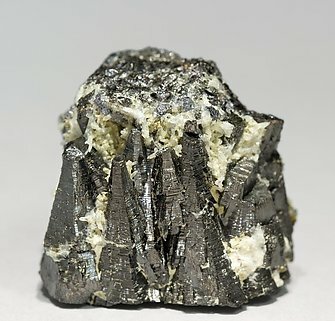 They have fine striations parallel to the main axis of the crystal, have a honey color and intense luster, being on matrix with small Jordanite crystals. The sample has intense doubly colored fluorescence, orange on the crystals and yellow on the matrix, and also a very notable phosphorescence. A novelty at Munich 2013. Very well developed pyramidal Wurtzite crystals of good size for the species. 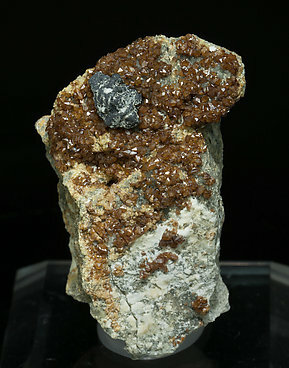 They have a brown honey color and intense luster, and are on matrix, with small Jordanite crystals. The sample has intense doubly colored fluorescence, the crystals are orange and the matrix is yellow, and also a very notable phosphorescence. A novelty at Munich 2013. Very well developed pyramidal Wurtzite crystals of good size for the species. 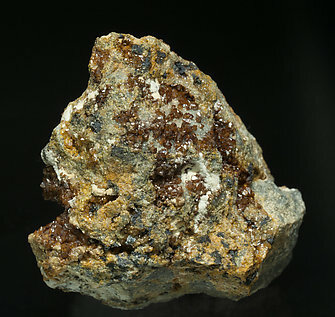 They have a brown honey color and intense luster, and are on matrix, with small Jordanite crystals and laminar Baryte crystals with geometric zoning. 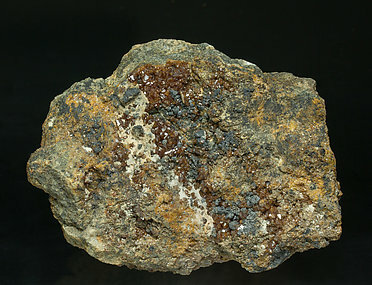 The sample has intense doubly colored fluorescence, the crystals are orange and the matrixis yellow, and also a very notable phosphorescence. 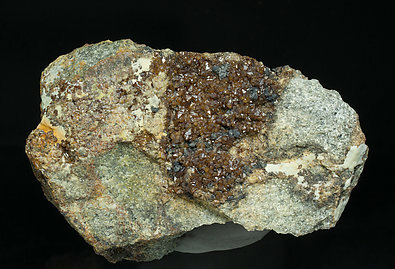 Parallel growth of black sharp crystals of good size for this rare dimorph of Sphalerite. They are very bright and are with Quartz. The locality is not well known but it produces some specimens of very good quality like this one. A very rare species, scarcely appearing in esthetic pieces. 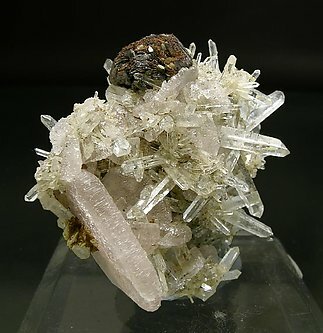 In this case there is a complete rosette of bicolored crystals of Wurtzite (some of them bright black and some other brown) and so well positioned on the Quartz matrix that it results in an attractive specimen. The group is completed by a curious Fluorapatite crystal, tabular and extra-flat.